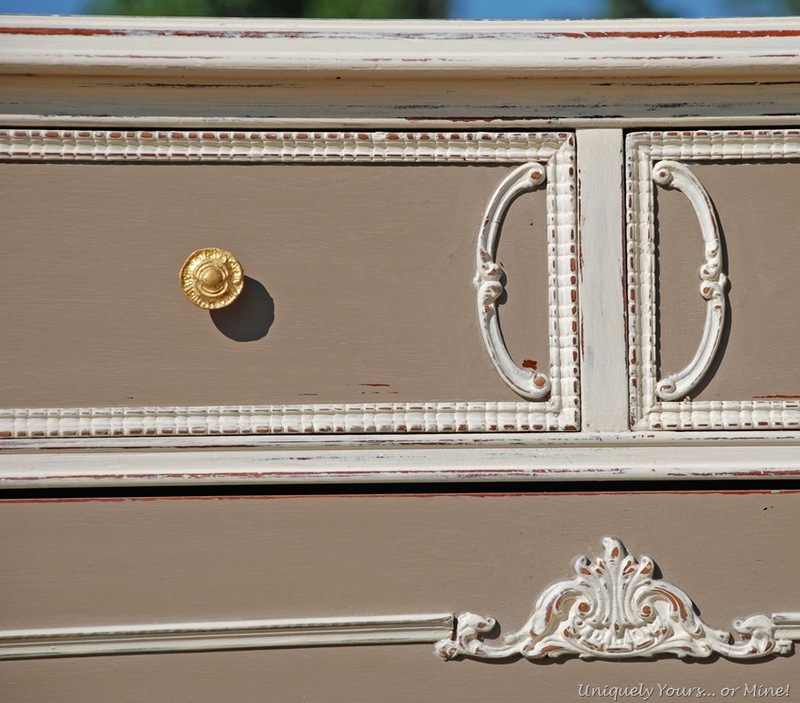 A Beautiful Dresser in Coco and Old White – Uniquely Yours… or Mine! I hope you all are enjoying your last month of Summer! This happens to be my birthday month, unfortunently we will be packing and moving during that week… but it’s ok as I will be sure to take a dinner break on the 27th to celebrate! Currently I am busy taking the last items off of the walls, patching and painting… and thinking ‘why in the heck did I put so much stuff up’… I think this is going to take forever! I’m also still finishing up the few last projects, but this one is my last custom client piece, hope you enjoy it! 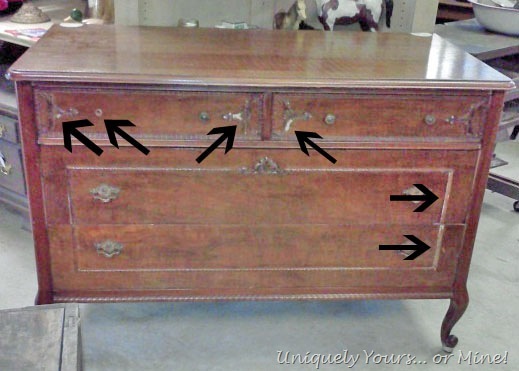 Here is the dresser, all of those arrows are pointing to places where the original molding was missing, one is because it was also missing a knob. Those white spots on the top back are from the mirror which was no longer with the piece when I bought it… so sad! I nailed the drawer bottoms back into place and filled the top holes with Minwax High Performance Wood Filler. I did sand the entire top down as it had some pretty good scratches and then restained it so that when I distressed the top it wouldn’t look different then the base. This is the beautiful After, it waited a long time to be fixed up, but I think it was worth the wait! 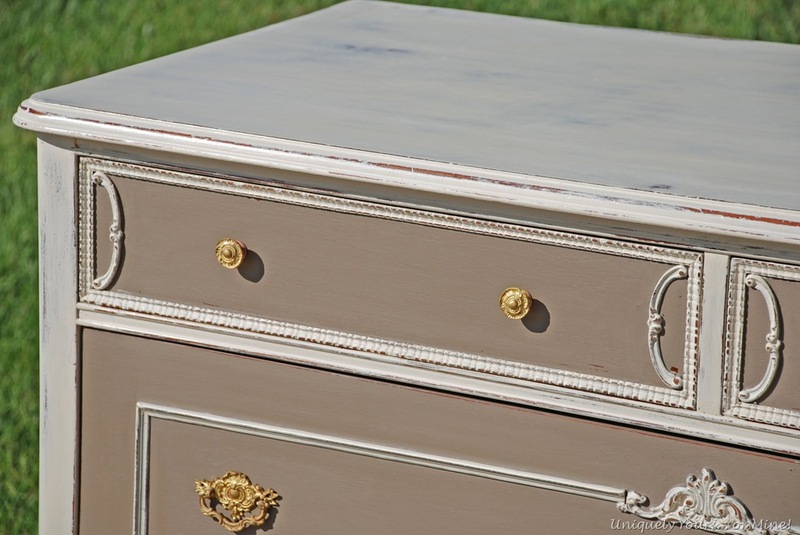 The colors are Annie Sloan Chalk Paint Coco and Old White, a very pretty combination! You can see where I added new trim on the two bottom drawers and removed some of the trim from the top drawers. I also “cheated” a little by copying one of the knobs in Photoshop and adding it to the drawer to make it look like I had all four knobs, sneaky right? My client purchased some very pretty glass knobs from Hobby Lobby to replace these, but I didn’t have them when I needed to take the photos. 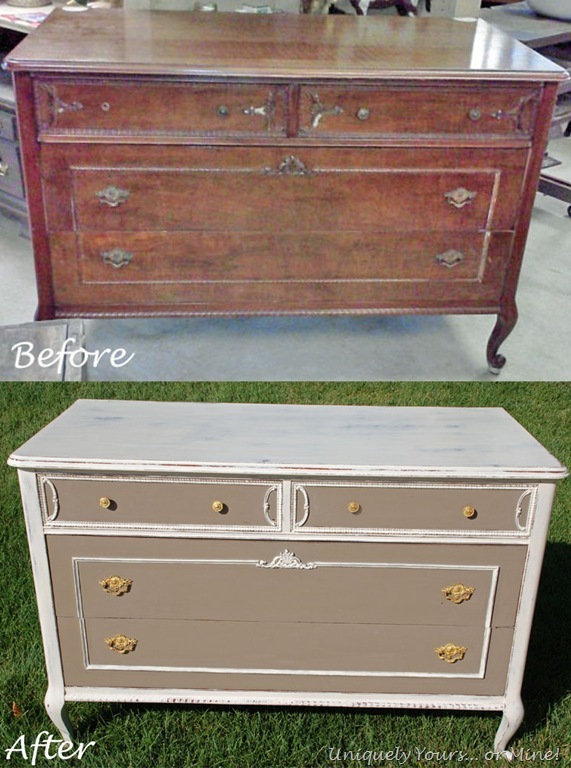 I painted 2 coats of Coco on the drawers then I painted the trim white. I distressed the paint with 220 grit sandpaper, using both an orbital sander and hand sanding on the more intricate areas. I then applied a top coat of Annie Sloan clear wax, buffed it with 0000 steel wool and polished it with a soft cloth until it shined! Even though there is less detail I’m still very pleased with what detail I was able to save. Adding the molding was easy, just cut the pieces on a 45, apply with Loctite and add a few tiny nails to hold it all in place. I cleaned the knobs with a soak of Ammonia and a little water, letting the knobs soak overnight. Aren’t these just gorgeous! 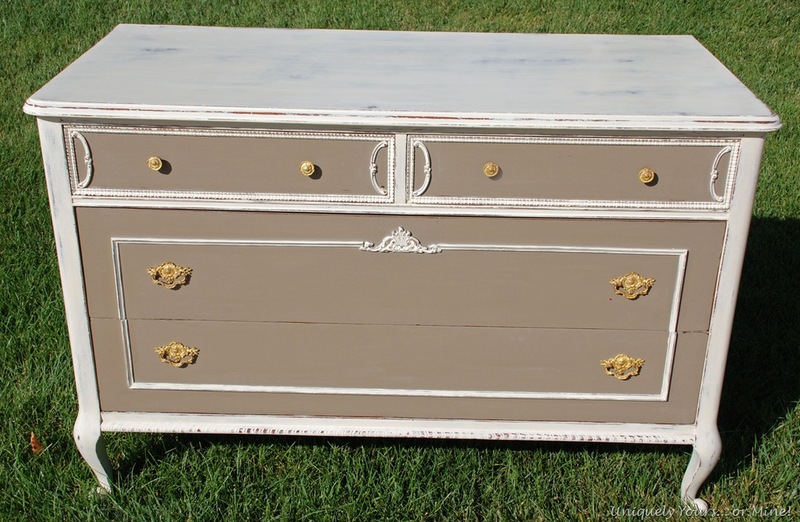 I hope my client loves this chest and the bed frame… as I enjoyed working with her and providing her with custom, one of a kind pieces to grace her home, thanks Tina! Pingback: A Beautiful Update Full Size Bed Frame | Uniquely Yours... or Mine! 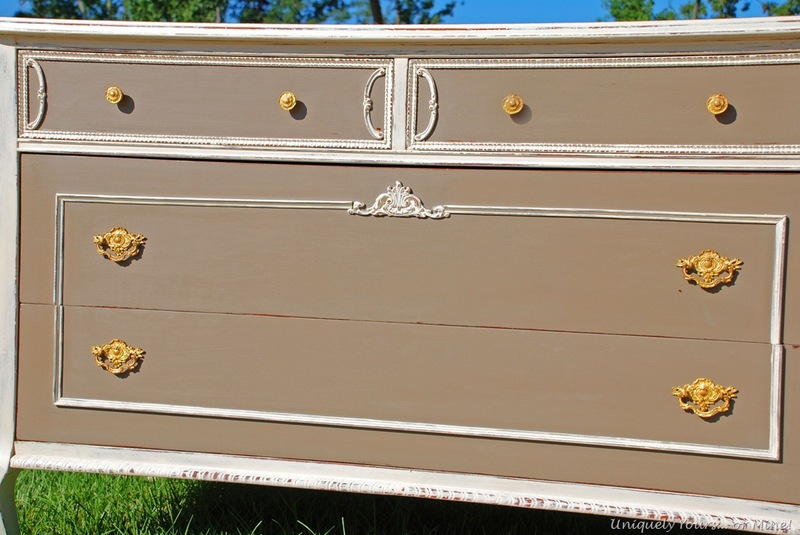 Absolutely gorgeous – this is the one that went with the headboard, right? ( at a reasonable price ) here in Montreal!!! 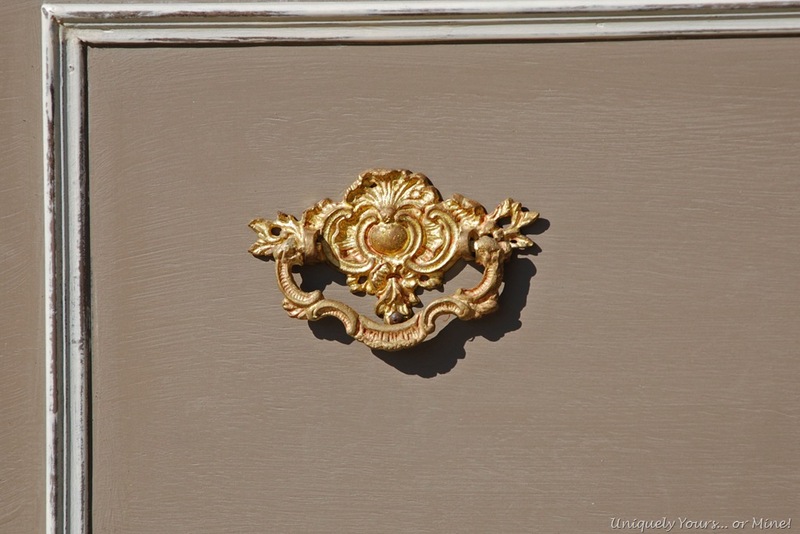 Oh what pretty details! I want to do something in that color combination! And those pulls are like the perfect finishing touch! 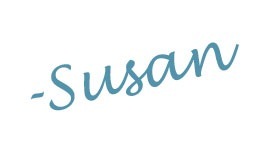 Thanks Sharon! The color combo really is very pretty! Beautiful work! Please move near me in St. Louis. It turned out fabulous! I love coco and old white together. In your garage since 2012 and you’re feeling embarrassed? I have things that have been in my garage for 3 years and I still haven’t got to them. Now THAT’S embarrassing!! you should be proud of your fine work!! Really nice job.